My daughter was less than a year old when I got divorced. Around the time she was 4-5 years old, there was a horrible and ugly court battle with my ex over custody….among other things. There were several events that occurred where the safety and security of my daughter was in jeopardy when she was with him. We were working with a therapist at the time. I remember tell her about what happened at the courthouse when my ex was yelling at me calling me a b**ch and several other things. I was an emotional wreck to say the least. 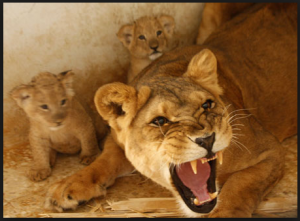 She said to me “think about how a lioness acts when her cubs are being threatened,” you are only doing what you think is best to protect your child from a dangerous situation. It is all about the perspective. I learned from that conversation that I have to fight for what I believe in and not care about what other people think or how they describe me. My child was in a dangerous situation and I did what I had to do to keep her safe.